Eh? 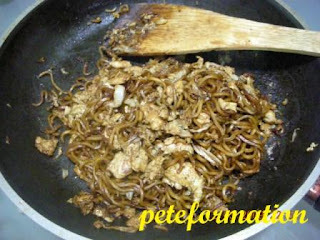 Your maggie goreng looks quite dark wan! I make this often at home...cuz easy and fast to cook. I throw all the curry flavouring inside when I fry, and the maggie looks like those mamak ones! LMAO. If put some meat or prawns, the taste will be better oso leh, Pete. Maybe next time you can put it in, I bet your kids will polish em off in seconds! Cleff : My kids very fussy with food, they will not eat whole prawns or meat but then sometime eat, sometimes don't want, kapala pusing lorrr! Levian : Ha ha, I am doing that to my kids. They like to eat mamee with all the flavouring in it. I always stop them from putting all but everytime they will do it quietly. i've problem with frying maggi mee.. it ends up too wet. Baby : Blanch it for 1 and a half minutes, then the texture would be nice!